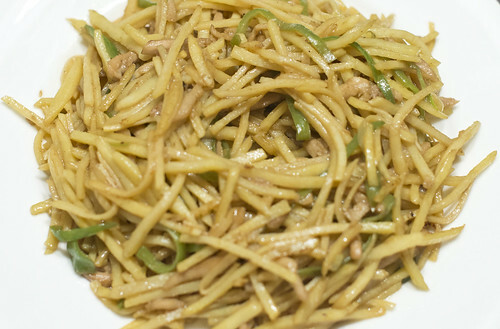 Stir fried shredded potato is one of our favorite dishes. There are many ways you can cook, and my 6yr boy likes the (slightly) sweet/sour version a lot. Ingredient: shredded potato (3 mid-size), green pepper (1-2), chick breast, garlic 1tsp minced. 4. Heat Le Creuset wok (here) before add oil. Stir fry marinated chicken till the color changes, than add the rest of vegi and garlic. 5. Switch to the middle heat, add 1 tbsp sugar, 1 tbsp vinegar, 2 tbsp soy sauce,1 tsp dried white pepper powder. Add salt if needed.